American singer/songwriter, record producer and entrepreneur Kenny Rogers, was born on 21 August 1938, in Houston Texas, and is identified as a ‘country singer’ by music fans, but has had over 120 single hits covering several genres. Kenny is known not only as a solo artist, but also a member of such groups as The Scholars, The New Christy Minstrels, and The First Edition with whom he released such singles as “Poor Little Doggie” and “But You Know I Love You”. So just how rich is Kenny Rogers, as of mid-2016? According to authoritative sources, Rogers’ net worth is estimated to be over $250 million – undoubtedly, the majority of Rogers’ wealth has come from his singing career, which began in the late 1950s. Kenny Rogers attended Jefferson Davis High School, and his first introduction to the music industry began with The Scholars, a band with which he recorded music in the mid-1950s. When the group disbanded, Kenny Rogers tried his luck with several other bands, including The Minstrels and The Bobby Doyle Three, but most of these bands were short-lived. Rogers spent almost ten years in The First Edition, however, in 1976 he went on to launch his solo career. Soon after joining the United Artists label, Rogers released his debut solo work under the title “Love Lifted Me”, which was followed by a more successful self-titled second studio attempt. The latter album spawned several singles, but it was “Lucille” that helped the album reach #1 on the Country charts. “Lucille” was so popular at the time that it topped the charts both in the US and the UK and, with more than five million copies sold, inspired the recording of many covers by various artists. A year later in 1978, Kenny Rogers came out with perhaps his most commercially successful album to date entitled “The Gambler”, which peaked at #1 on the Billboard Top Country Albums, and produced a single called “The Gambler”, which won a Grammy Award for Rogers. As a solo artist, Kenny Rogers has released several studio works that have sold well, including “Kenny” which topped the Country charts, “The Gambler”, and “Water & Bridges”. Kenny has released 32 studio albums and 49 compilation albums, which spawned a total of 80 singles. 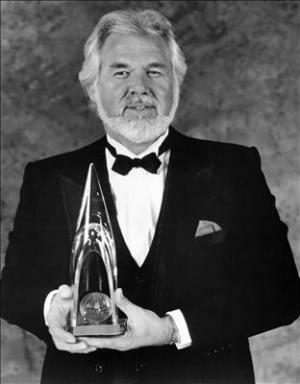 An inductee into the Country Music Hall of Fame, Kenny Rogers is a winner of several Grammy, Country Music Association and American Music Awards among many others. In addition to being a musician, Kenny Rogers proved himself to be a talented actor, as he has appeared in many television productions, the most notable being “Kenny Rogers as The Gambler”, a commercially successful television series that not only inspired the creation of four sequels, but also won an Eddie Award, and received several Emmy Award nominations. Kenny also made appearances in such television projects as “The Dream Maker” with Katey Sagal, and “Six Pack” series with Anthony Michael Hall. In his personal life, Kenny Rogers has married five times, firstly to Janice Gordon from 1958 to 1960 with whom he has a child, then to Jean from 1960 to ’63, thirdly to Margot Anderson from 1964 to ’76, followed by Marianne Gordon from 1977 to ’93 with whom he has a son. He has been married to Wanda Miller since 1997, with whom he has two children. Children Christopher Cody Rogers, Justin Charles Rogers, Jordan Edward Rogers, Carole Rogers, Kenny Rogers Jr.
Record Labels United Artists, Mercury, Giant, Reprise, Atlantic, Curb, RCA, Dreamcatcher, Capitol, WEA, Warner Bros.
1 [on performing with Dolly Parton] Working with Dolly is a great rush for me because we are good friends, and we have been, forever. We just flirted a lot. I can't explain it, but flirting is more electric than passion. It's the anticipation. She does it better than anybody I've ever seen, and it's just good fun. 2 Don't be afraid to give up the good to go for the great. 1 Member of The New Christy Minstrels and The First Edition before launching a solo career that produced 20 top-40 hits from 1977-84. The singer, guitarist and bassist specialized in easy listening music with a country flavor. 2 His mother was Lucille Rogers, and his siblings included brothers Lelan Rogers & Roy Rogers, and sister Sandy Rogers. 3 On Oct. 27, 2013, he was inducted into the Country Music Hall of Fame. 4 He was awarded a Star on the Hollywood Walk of Fame for Recording at 6666 Hollywood Boulevard in Hollywood, California. 5 Sang "Lady" with Lionel Richie playing piano. 6 His duet "Islands in the Stream", with fellow country singer Dolly Parton was ranked the #1 on CMT 100 greatest country duets of all time. 7 Co-host, with Lorianne Crook, of an infomercial for TimeLife's "Superstars of Country" collection of country music . 8 Identical twin sons, Justin Charles (6 pounds, 10 ounces) and Jordan Edward (5 pounds, 8 ounces) were born on Tuesday, July 6th, 2004 in Atlanta, Georgia. His wife, Wanda, is an identical twin, and twins also run in Kenny's family. 9 On a lark, he once performed as himself as part of the "Legends In Concert" impersonators show at the Imperial Palace Casino in Las Vegas, Nevada. He sang the duet "Islands In the Stream" with the Dolly Parton impersonator. Several people from the audience interviewed after the show didn't realize that he was the real thing. 10 Father of Christopher Cody Rogers with Marianne Gordon. 11 His high school vocal group's original song "That Crazy Feeling" landed them a spot on television's New American Bandstand 1965 (1952). 12 In March 1999 was awarded the Recording Industry Association of America's prestigious Diamond Award, celebrating sales of more than 10 million albums for his "Greatest Hits" album. 13 Voted "Favorite Male Vocalist" in 1989 by "People" magazine readers. 14 Named "Favorite Singer of All Time" in a 1986 "PM Magazine/USA Today" poll. 15 Established the Athens Area Homeless Shelter in 1990 in Georgia. 16 Is a well-respected photographer; was invited to the White House to create a portrait of First Lady Hillary Clinton for the 1993 CBS-TV special, A Day in the Life of Country Music (1993). 17 He appeared in the music video and sang in the choir on the song "Voices That Care." song "We Are The World." Smoky Mountains Rise: A Benefit for the My People Fund 2016 TV Movie performer: "Islands In The Stream"
No Escape 2015/I performer: "Ruby, Don't Take Your Love to Town", "Don't Fall in Love with a Dreamer"
Fúsi 2015 performer: "Islands in the Stream"
Backstory: Dolly Parton 2014 TV Movie performer: "Islands In The Stream"
Kenny & Dolly: An Intimate Conversation 2013 TV Movie performer: "Islands In The Stream", "You Can't Make Old Friends"
Anchorman 2: The Legend Continues 2013 performer: "Lady"
Dallas Buyers Club 2013 performer: "Ruby, Don't Take Your Love to Town"
Backstory: Kenny Rogers 2012 TV Movie performer: "Islands In The Stream"
The Nation's Favourite Bee Gees Song 2011 TV Movie documentary performer: "Islands In The Stream"
Hick 2011 performer: "Island in the Stream"
Kenny Rogers: The First 50 Years 2011 TV Movie performer: "Through The Years", "Islands In The Stream", "Don't Fall In Love With A Dreamer", "We've Got Tonight", "Lady", "The Gambler" / writer: "Sweet Music Man"
CMT: 40 Greatest Love Songs 2011 TV Movie performer: "Lady"
Faster 2010 performer: "Just Dropped In To See What Condition My Condition Was In"
Dolly Celebrates 25 Years of Dollywood 2010 TV Movie performer: "Islands In The Stream", "I Will Always Love You"
Tony Hawk: Ride 2009 Video performer: "Just Dropped In To See What Condition My Condition Was In"
The Queens of Country 2009 Video performer: "Knock Three Times", "Love Lifted Me", "He's Got The Whole World In His Hands", "The World Needs a Melody", "Spanish Eyes", "Brown Eyed Handsome Man", "Blue Eyes Cryin' In The Rain"
Jake's Adventures in Dollyworld 2007 TV Movie documentary performer: "Islands In The Stream"
Dolly Parton & Friends 2007 Video performer: "Knock Three Times", "Love Lifted Me", "He's Got The Whole World In His Hands", "The World Needs a Melody", "Spanish Eyes", "Brown Eyed Handsome Man", "Blue Eyes Cryin' In The Rain"
The Kennedy Center Honors: A Celebration of the Performing Arts 2006 TV Special performer: "Islands in the Stream"
40th Annual Country Music Association Awards 2006 TV Special performer: "Islands In The Stream"
Best of Country Live! 2006 Video performer: "Am I Too Late"
Kenny Rogers: The Journey 2006 Video performer: "Islands In The Stream"
CMT Greatest Moments: Dolly Parton 2006 TV Movie documentary performer: "Islands In The Stream"
CMT: 100 Greatest Duets Concert 2005 TV Special performer: "Islands In The Stream"
Grand Theft Auto: San Andreas 2004 Video Game performer: "Just Dropped In To See What Condition My Condition Was In"
Celebrity Poker Club 2003 TV Series "The Gambler"
Dolly Parton: Platinum Blonde 2003 TV Movie documentary performer: "Islands In The Stream"
Anita & Me 2002 performer: "Ruby Don't Take Your Love To Town" as "Baby Don't Take Your Love To Town"
The Pledge 2001/I performer: "Through The Years"
Late Night Poker 1999 TV Series "The Gambler"
The Big Lebowski 1998 performer: "Just Dropped In To See What Condition My Condition Was In"
Und vor mir die Sterne... - Das Leben der Schlagersängerin Renate Kern 1998 Documentary performer: "The Greatest Gift of All"
I'll Be Home for Christmas 1997 TV Movie performer: "I'll Be Home For Christmas"
Country Music Association's 35th Anniversary 1993 TV Special performer: "You Decorated My Life"
Christmas in America 1990 TV Movie performer: "Christmas in America"
24th Annual Country Music Association Awards 1990 TV Special performer: "Love Is Strange"
Kenny, Dolly and Willie: Something Inside So Strong 1989 TV Movie performer: "The Gambler", "Mamas Don't Let Your Babies Grow Up To Be Cowboys", "Sweet Music Man", "Two Doors Down", "Real Love", "Islands In The Stream", "When You Put Your Heart In It", "Planet Texas", " Something Inside So Strong" / writer: "Sweet Music Man", "When You Put Your Heart In It"
DTV 'Doggone' Valentine 1987 TV Movie performer: "Lady"
Light of Day 1987 performer: "The Pride Is Back"
Shades of Love: Make Mine Chartreuse 1987 TV Movie lyrics: "We've Got Tonight" / music: "We've Got Tonight" / performer: "We've Got Tonight"
Tough Guys 1986 performer: "They Don't Make Them Like They Used To"
Kenny Rogers and Dolly Parton: Together 1985 TV Movie performer: "Real Love", "Rueben James", "Coward of the County", "She Believes in Me", "She's a Mystery", "We've Got Tonight", "Blaze of Glory", "April", "Crazy", "Sweet Music Man", "We Are the World", "A Little More Love", "The Stranger", "Islands in the Stream" / writer: "Crazy", "Sweet Music Man"
Kenny & Dolly: A Christmas to Remember 1984 TV Movie documentary performer: "A Christmas to Remember", "The Christmas Song", "With Bells On", "The Greatest Gift of All", "Silent Night", "I Believe in Santa Claus", "Christmas Without You", "Once Upon a Christmas"
Bagets 1984 performer: "You and I"
Kenny Rogers as The Gambler: The Adventure Continues 1983 TV Movie performer: "The Gambler"
17th Annual Country Music Association Awards 1983 TV Special performer: "Islands In The Stream"
Six Pack 1982 lyrics: "Love Will Turn You Around" / music: "Love Will Turn You Around" / performer: "Love Will Turn You Around"
Coward of the County 1981 TV Movie performer: "Coward of the County"
Urban Cowboy 1980 performer: "Love The World Away"
Kenny Rogers as The Gambler 1980 TV Movie performer: "The Gambler"
11th Annual Country Music Association Awards 1977 TV Special performer: "Lucille"
Trackdown 1976 performer: "Runaway Girl"
Once Upon a Wheel 1971 Documentary performer: "Camptown Ladies"
Rio das Mortes 1971 TV Movie performer: "Ruby, Don't Take Your Love to Town"
Fools 1970 performer: "A Poem I Wrote for Your Hair", "Someone Who Cares"
Flap 1970 performer: "If Nobody Loves"
Who is Kenny Rogers, how old is the country singer, who’s his wife Wanda and why did he cancel his tour? Why did Kenny Rogers cancel his farewell tour, where was he due to perform and can you refund your tickets? “Eastbound & Down” (2009-2013) “The Bobby Doyle Three” “The Gambler”“Love Lifted Me” “The Minstrels” $250 Million 1938 20 Greatest Hits 5 ft 11 in (1.82 m) Academy of Country Music Awards Actor Ame American Bandstand (1952-1989) American Eagle Award (2010) American Music Award American Music Awards Anthony Michael Hall Artist ASCAP Golden Note Awards Atlantic August 21 Author BBC's Greatest Country Singer Carole Rogers Christopher Cody Rogers Country music Country Music Association Awards Country Music Hall of Fame Country Music Hall of Fame and Museum Curb Dreamcatcher Edward Floyd RogersRollin' on the River Entrepreneur Giant Grammy Award Grammy Awards Houston Janice Gordon (1958-1960) Jean Rogers (1960-1963) Jordan Edward Rogers Justin Charles Rogers Katey Sagal Kenneth Donald "Kenny" Rogers Kenneth Donald Rogers Kenneth Ray Rogers Kenny Kenny Rodgers Kenny Rogers Kenny Rogers & The First Edition Kenny Rogers and The First Edition Kenny Rogers as The Gambler (1980) Kenny Rogers Jr. Kenny Rogers Net Worth Love Lifted Me Lucille Lucille Rogers Margo Anderson (1964-1976) Marianne Gordon (1977-1993) Mercury Music Music artist Musician New Christy Minstrels Photographer RCA Record producer Reprise rican Music Awards"Capitol" Rogers Singer-songwriter Singers Six Pack Texas The First Edition The Gambler The Gambler Returns: The Luck of the Draw (1991) The Kenny Rogers Story The Real West (1992) United Artists United States United States of America Visual Artist Wanda Miller Wanda Miller (m. 1997) Warner Bros. WEA What About Me?